This week we visit a son of the Land of the Rising Sun. 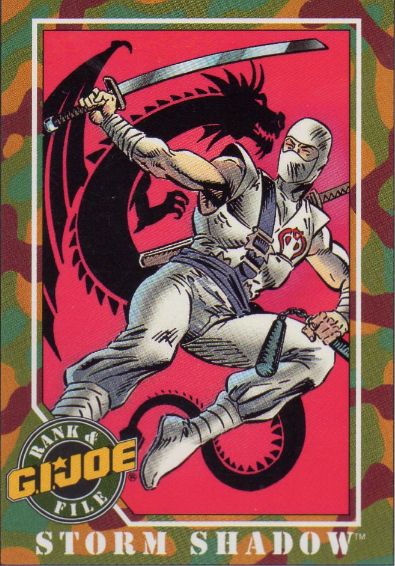 Tommy Arashikage, better known as the Cobra Commander’s ninja bodyguard and assassin, Storm Shadow. In the original cartoons, his rivalry/friendship with Snake-Eyes was replaced by honorable fights with Spirit and Quick Kick. The DIC cartoons however, follow the toy line more closely and in these episodes, Storm Shadow is a member of the G.I. Joe Ninja Force. Later on in the Spy Troops and Valor vs Venom cartoons/movies, Stormy is back with Cobra and does have some face-offs with Snake-Eyes. As for what the figures is concerned, there are about 7,452 different versions of Storm Shadow out there. (The actual number may be closer to 50, but hey, who’s counting). I recently got the v9 from 2002. Here he is wearing his suit from the Ninja Force, but it’s red and has a Cobra sigil. The most cherished Storm Shadow in my collection is the v4 from 1994. This is the color changing Shadow Ninja one. I have the Belgian Ducth/French carded one (I also have Snake Eyes v6 carded). Lastly, I just saw the v1 of Storm Shadow posted by a fellow collector an Instagram I want to show to the world. It’s like a toothpaste commercial, so WHITE! Check it out here. 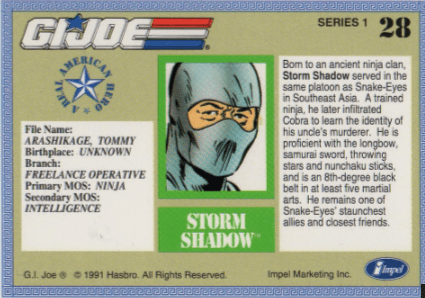 In Dutch, Storm Shadow is called “Bliksemschicht”, which translates into Lightning Bolt (落雷 in Japanese). Next time, we’ll tackle one of my all time favorite figures. We have dived and have arrived. Card #27 is up today and let’s not get astray. Rhyming like I’m Roadblock, just cause I’ve got writer’s block. Playing on you some mind tricks cause this post features Deep Six. 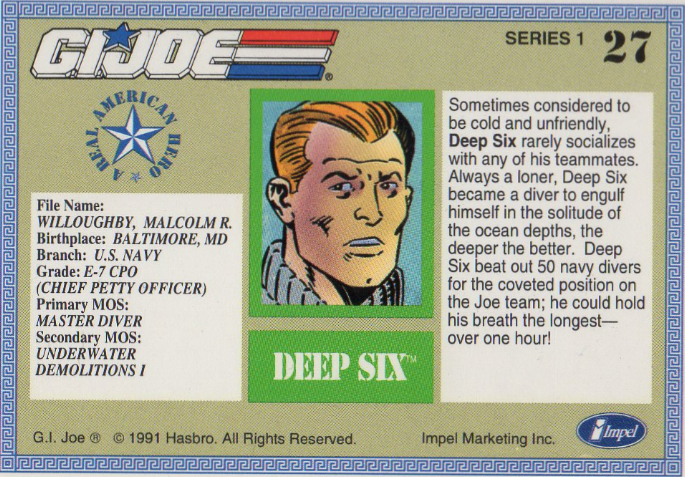 His filecard describes Deep Six as being a social loner within the Joe team. I can only guess, but I guess it has something to do with his high-pressure diving suit. Being locked into that probably feels like being in a coffin. Claustrophobic anyone? The toy figure is undoubtedly the least articulate Joe figure of all time. Not counting the dogs, wolfs and parrots 🙂 It was released with the S.H.A.R.C. vehicle, some sort of crossover between a fighter jet and a one-man submarine. I really do like the S.H.A.R.C. as a toy, it’s versatile and not too big, nor too small. The Deep Six, however, is not one of my favorites. I didn’t have the original 1984 figure, but the 1989 one with the bright orange helmet. I always saw G.I. Joe as sci-fi, but then in the not so distant future (as they put it in the movies). Why would you have a guy in a big metal suit in which he can hardly move in a high-tech team? Same goes for the 1989 figure, his diving suit offers more maneuverability, but it still looks more steampunk than G.I. Joe worthy. Then came the 1992 Eco-Warriors figure that was released with the dolphin Finback. 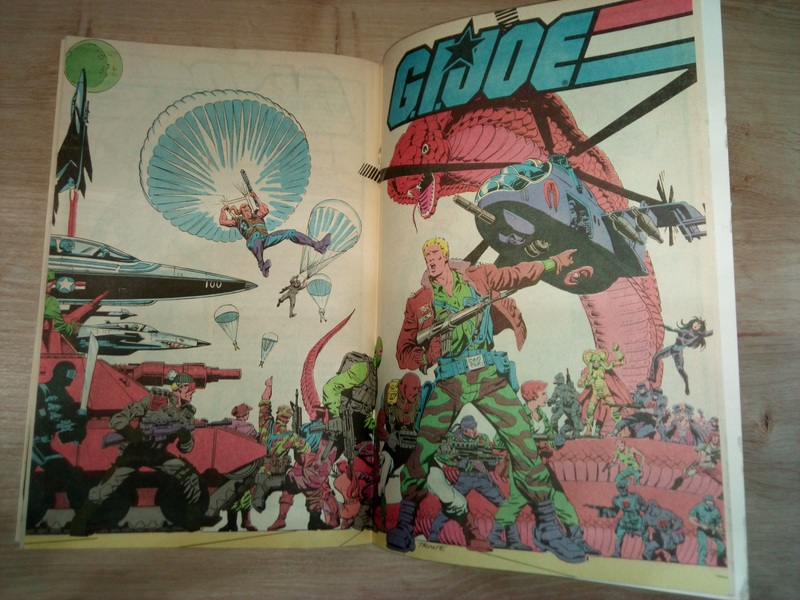 He had a more futuristic look and finally looked in place with the Joes, albeit in bright colors. That’s it for now. Next time we will explore the shadows of Japan… Mysterious, right? Author European JoePosted on January 22, 2017 Categories G.I. 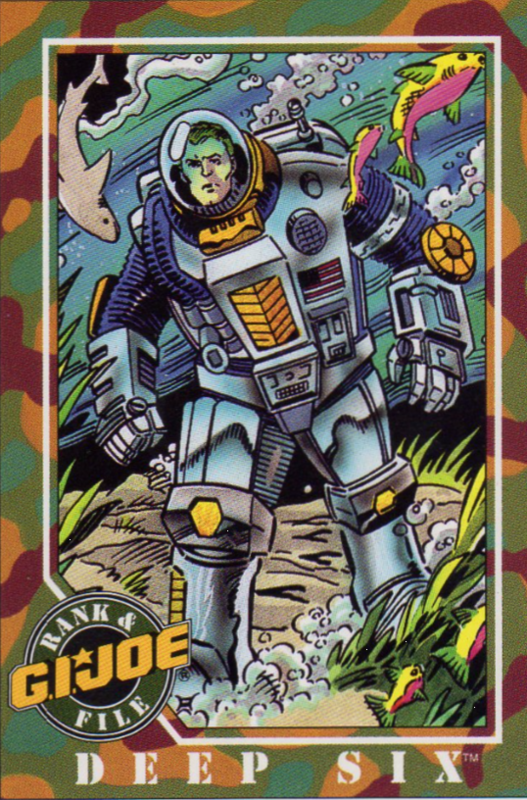 JoeTags #27, deep six, gijoe, impel, trading cardsLeave a comment on We’re going under! We are already past the halfway point of the first month of this year. Just another 23 half months to go and we will be celebrating a new year again. In this post, I want to talk about the things I want to do with the blog and Joe collection this year. There are 2 main themes that will continue throughout the year. Number 1 being the Impel Trading Cards. We still have a long way to go till we covered the full set, so I’m thinking of speeding things up a bit by covering more cards in one post or maybe posting more frequently if I can find the time to do so. Secondly, I will keep posting random collector’s stuff. New figures and vehicles for my collection, new paraphernalia and so on. I’ve decided to put aside some money each month dedicated to the purchase of new Joe stuff. This way, I hope I can expand my collection and also put some more posts online. I plan on (finally) getting around to unpacking all my Joes that I retrieved from my parent’s house and getting them all sorted. Next will be to list up the ones that are missing, and chasing these down one by one, starting with the 1982 series and working my way through the years (and brighter getting colours). This year, I would also like to start writing some more. Not just on the blog, but also putting a novel to paper (or screen if you will) that I’ve been writing in my head for a while. It’s Joe related, so I will post something about this soon. As you’re probably aware, English is not my native tongue, so if you’re interested in proofreading and giving me some (hopefully positive) feedback or just some tips, let me know in the comments or via Twitter. So that’s the plan for 2017, keep on doing what I’ve been doing and putting some more words down to get my writing back on track. I want to take the opportunity to thank you all for reading my posts and giving me feedback and likes. Without us, G.I. Joe probably wouldn’t be alive anymore, so let’s keep on blogging,vlogging and creating podcasts, tweet your heart out and keep posting amazing Instagram shots. We are the Greenshirts! Rather than going for the same old title, Impel Trading Card #26, I thought I’d go back to ‘somewhat mysterious yet totally understandable for Joe fans’ titles. I also tried to add a bit of structure to the post, let me know what you think. 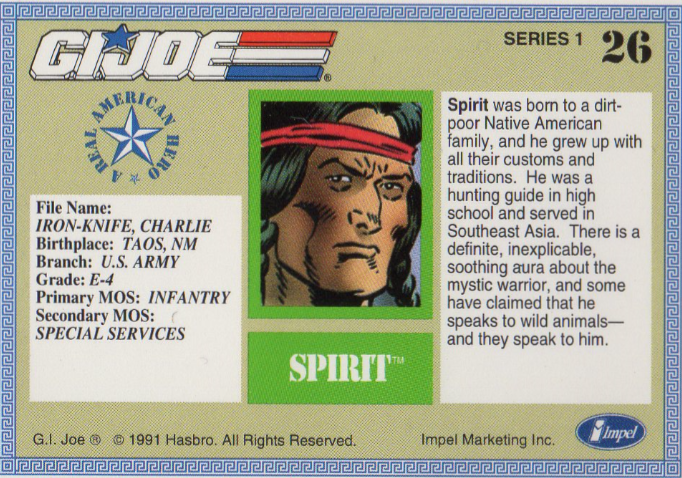 Now, without further ado, here is card #26, Spirit (the G.I. Joe that will later be known as Spirit Iron-Knife). Between 1984 and 1993, the figure was called Spirit. During this time, 4 iterations were released. 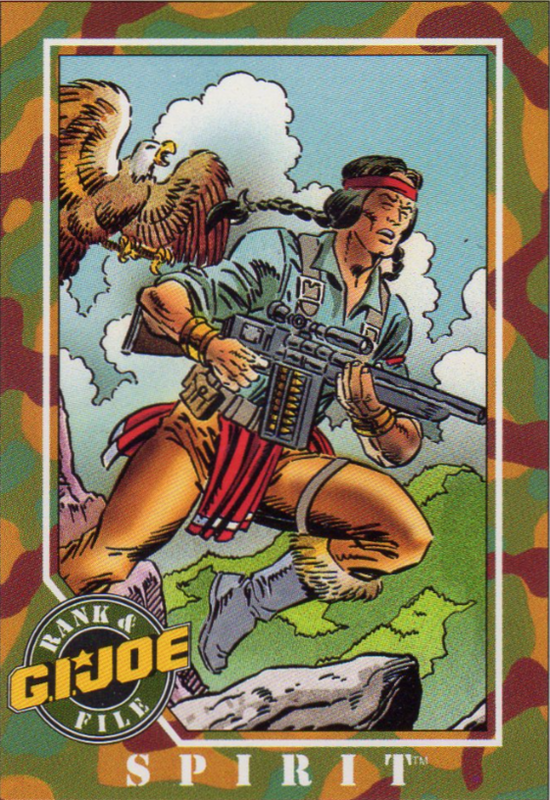 I don’t have the original figure (depicted here on the card), my first Spirit figure was the 1989 figure that was part of the Slaughter’s Marauders sub-line. I had a few figures of the Marauders, but I’ve always found the colors to be very bright. I did however like the eagle Freedom that was included with the figure and the fact that he was a Native American. I do remember that his hair came off quite easily and that I needed to glue the hairpiece back on. I recently acquired the 1992 version that was part of the Air Commandos subset. This time, his hair is tied in a single ponytail with a red and white hairband. And this time, the hair didn’t come off. He came with the G.I. Joe glider, star-spangled in red, white and blue. Easily the best looking glider of the set. From 2005 onward, Hasbro changed the name of Spirit to Spirit Iron-Knife. So he got his own last name added to his code name. Not very secretive… There are 6 figures released under the new Spirit Iron-Knife name. From those last figures, I only have the first one (2005) in my collection. After 1995, it became very difficult to find any Joes around here in the shops. The internet was not yet the big shopping mall it is today and so my collection didn’t grow anymore – apart from some of the older toys I could find on flea markets. In the Comic Books, the first image I remember of Spirit is that he is the one who was sitting on top of the entrance to the (new) Pit. Doing some research for this post, Spirit appears quite a lot earlier in the comics. He was assigned – with Airborne, a fellow Native American – to guard Snake Eyes in his cabin back in issue #31. He also plays a big part in the Millville story, where he and Mutt visit Mutt’s uncle when Cobra swoops in to town and brainwashes most of the people there. In the cartoon series, Spirit takes over the role from Snake Eyes in the everlasting duel with Storm Shadow. I never really understood as to how a Native American Shaman could be a match for a highly skilled ninja. The only explanation I can find, is that it’s hard to have a character not talking in a cartoon. Probably the same reason why they introduced Duke and Scarlett as having a fling in the cartoon, rather than the Snakelett (ScarEyes sounds to creepy) we all love. Naturally, Spirit also used his knowledge to inform us in one of the legendary PSA shorts, What to do if you catch fire? Check it out below. Now you know, and knowing is half the battle. Author European JoePosted on January 15, 2017 January 22, 2017 Categories G.I. 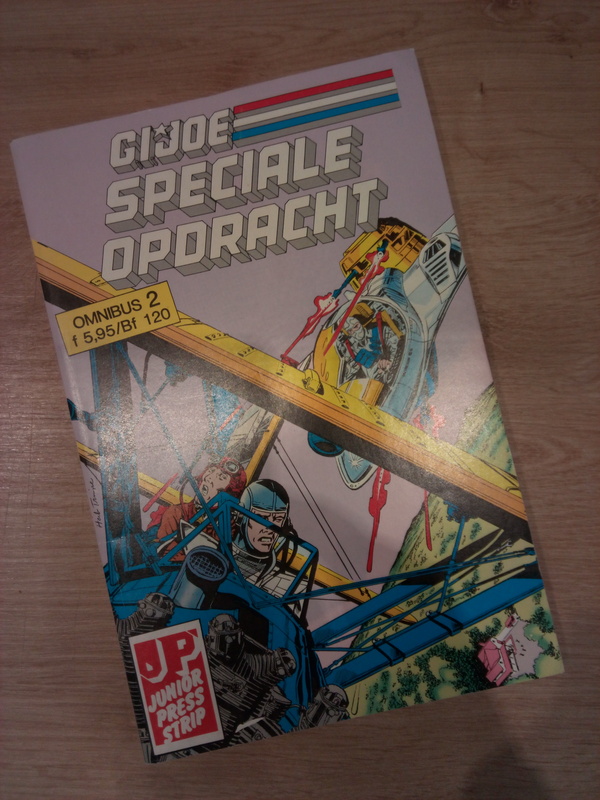 JoeTags #26, gijoe, impel, trading cardsLeave a comment on That’s the Spirit!